COST: $30 per person, includes the BEST SEATS available on the night of the show, a wine and cheese reception, $5 cash bar all night, and free coat check. Add $7 to your budget if parking on site. REQUIRES REGISTRATION: Yes, can be relatively last minute. Fill out THIS form to create a FREE account with Allegro - Opera Under 35. The process takes about five minutes. Your account will be created right away and you will have the opportunity to buy $30 tickets for all operas performed by Calgary Opera. The next show is Eugene Onegin taking place on February 3rd, 7th, and 9th. START: 6:30 P.M. at the Jubilee Room for a wine and cheese reception. Make sure you bring cash to purchase drink tickets; the charcuterie is free. The free coat check is located across the Jubilee room; however, it is not monitored for security. FINISH: 7:30 P.M. the main show begins. Shows do have a 20 minute reception, but this flies by really fast! NOTES: The Allegro - Opera Under 35 is a special program for those who are under the age of 35 and interested in the opera. Your tickets will be held at the Box Office and released to you after IDs are checked for all members of your party to ensure that you are indeed under 35 years of age. The best part of this program is that you get to sit in the BEST SEATS available on the night of the performance. 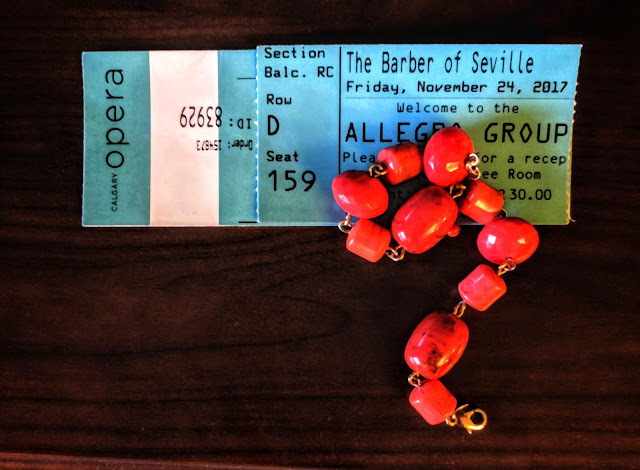 We recently saw Barber of Seville and sat in the first balcony; these tickets are priced at $144 each on the Calgary Opera website. The only potential downside to this program is that you do NOT get to choose the date. The Allegro group picks one of the dates on which the opera is being performed and this package is only available on that night.